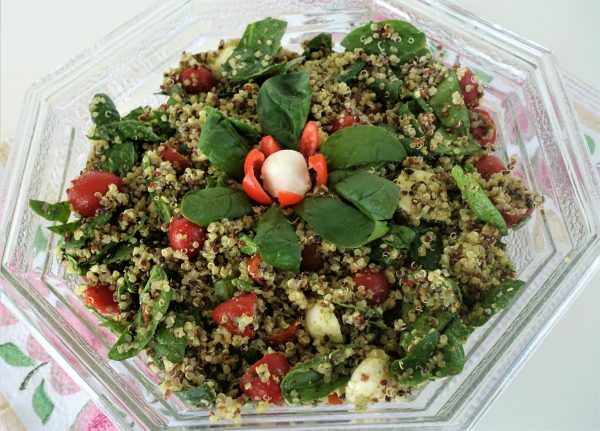 This Quinoa Salad with Magic Green Sauce became my favorite from the first time my daughter-in-law served it for lunch during one of our visits. It could easily be a light lunch meal in itself, or as an accompaniment to a main course. Today I will share a recipe for the salad, since you already have the recipe for the sauce/dressing from my previous post. 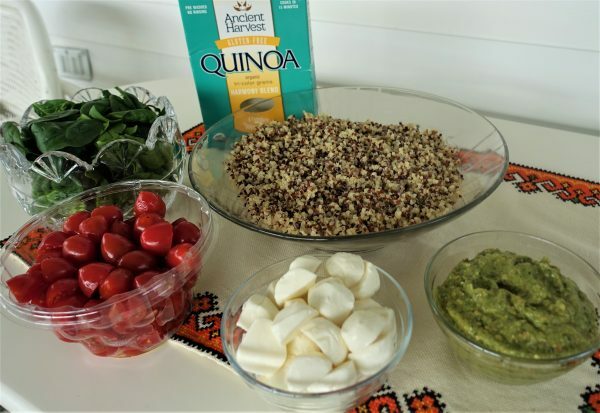 It is very simple to prepare, since the quinoa and the sauce may be prepared ahead of time and kept refrigerated until ready to mix together just before serving. I suggest to under-cook, rather than overcook the quinoa, so it does not get mushy and clumpy once mixed with the sauce and the other ingredients. I used the mixed grain quinoa (that is what I had on hand), but you can use the regular one which does not have the darker color grain. They both taste the same, just look different. 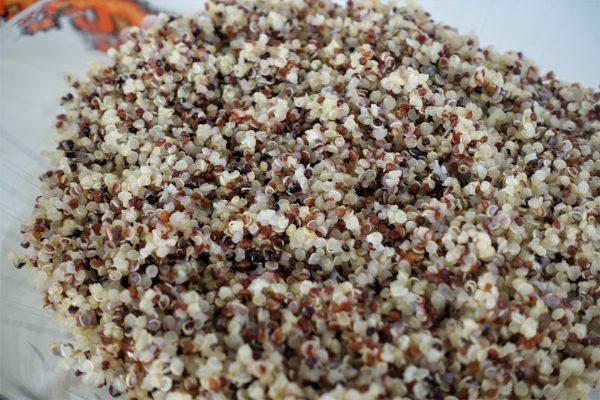 Prepare the quinoa for cooking, by rinsing it under running water until the water runs clear. In a medium saucepan add 1 1/3 cups cold water, 1 bouillon cube and rinsed quinoa. Uncover, mix, with a spoon few times from bottom up, set aside, and let it stand until totally cooled. Transfer 2 cups of cooked quinoa into a large bowl to get it ready to mix with other ingredients, or cover it and store it in the fridge for later use. Add tomatoes, spinach leaves and mozzarella balls. Mix gently to incorporate all ingredients evenly. The leftover salad still holds up well for at least 2 more days, but after that it begins to accumulate a little bit of liquid at the bottom of the bowl.